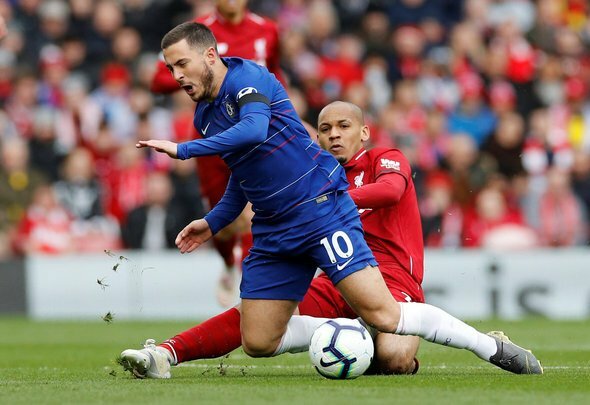 When you are coming up against a side with the quality that Chelsea possess – namely Eden Hazard – you know your defensive players are going to have to be on their toes at all times. On Sunday afternoon it was Liverpool’s job to try and silence the Blues at Anfield and they did an impressive job in the first 45 minutes. While everyone carried out their duty expertly, it was midfield enforcer Fabinho who the Liverpool faithful were left drooling over on Twitter. The 25-year-old was exceptional from the first minute and tracked the likes of Hazard stride for stride, executing perfectly times tackles to win the ball back for his side and nullify the visitors’ attacking threat. Having taken the first half of the season to get to speed with the Premier League, the Brazilian looked right at home on Sunday and his performances are going to be crucial if the Reds are going to pick up the title come the end of the campaign. Not only is he a brilliant defensive minded midfielder, he also has the passing range and ability to set his teammates up in attack. No wonder Jurgen Klopp was delighted to secure his signing last summer. Fabinho all over hazard rn ??????? ?